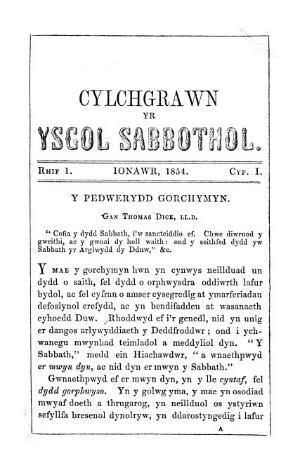 A monthly Welsh language religious periodical serving the Sunday schools of the Calvinist Methodist denomination, mainly in Anglesey and Caernarfonshire. The periodical's main contents were religious articles alongside news related to the two counties' Sunday Schools. The periodical was edited by Williams Vaughan Willams (Llygadog), Caernarfon. Associated titles: Yr Esboniwr (1854).